Presented by Senator BOYLE of Cumberland. Biddeford, SANBORN of Gorham, THERIAULT of Madawaska. This new legislation is not necessary due to the fact that last year legislation was introduced and passed to impose a dredging season from June 15 to September 15. With this law in effect the spawning period for trout and salmon are protected. This should be enough right? Wrong. Trout Unlimited seems to think otherwise, they are the driving force behind this legislation. 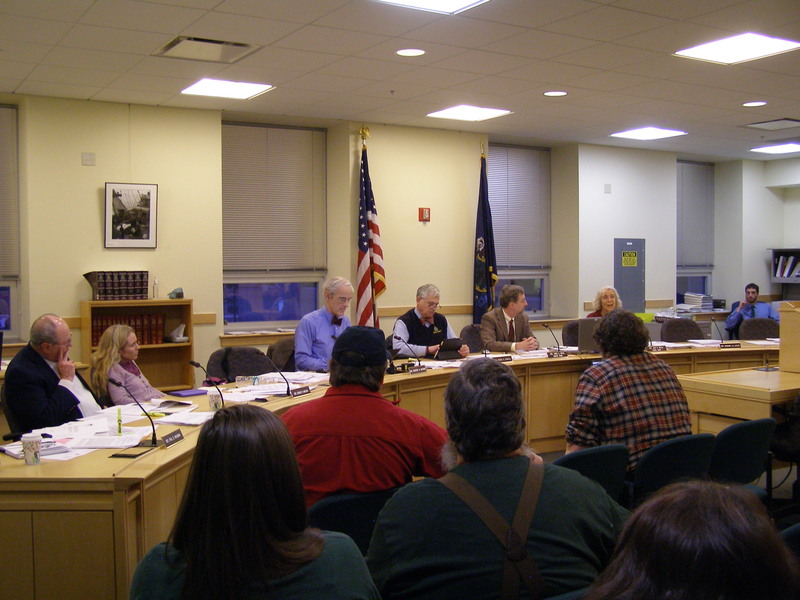 On January 27, 2014 there was a public hearing on LD 1671 before the Environment and Natural Resources Committee at the Cross building in Augusta Maine. John Clark (Hillbilly John) and I were in attendance along with members of Central Maine Gold Prospectors, Prospectors from Maine, New Hampshire, Vermont, Connecticut and New York. Testimonies started with those in support of LD 1671, each person was given 3 minutes to speak for a 30 minute period and then those in opposition had the floor for the same amount of time and back and forth until every ones testimony was heard. A lot of the testimony I heard from those that support this legislation was based on opinion and conjecture. Laws should be based on facts not on opinion and conjecture. Over the past several decades there have been studies performed and reports written by professionals on the effects of small scale recreational gold suction dredging. Many of which were presented to the Environment and Natural Resources Committee for their review. Scientific studies have identified both detrimental and beneficial effects from this level of mining. Dozens of studies on the environmental effects from small scale mining, and in particular “in-stream suction dredge placer mining”, have been performed by various agencies since the 1980’s, including the U.S. Environmental Protection Agency, U.S. Army Corp of Engineers, U.S. Geological Survey, and other federal and state agencies and universities at the cost of millions of dollars. To date, other than a few short-term and highly localized detrimental effects that are already mitigated to the point of being “less than significant”; the only other effects studies identified were beneficial to fish, the aquatic habitat, and the economy. 2013, U.S. Environmental Protection Agency Biological Evaluation Small Suction Dredge Placer Mining in Idaho reached the conclusion that suction dredge mining would have a less than significant impact on the environment. In 1999 the U.S. Environmental Protection Agency reported the results of a cumulative field study evaluating the performance of 10, 8, and 4 inch gold dredges and concluded environmental impacts from these operations were less than significant (Royer et al., 1999). All of these reports agree that the effect of small-scale gold suction dredging on the environment is less-than-significant, minimal, or immeasurable. Net Environmental Benefits of Small-scale Suction Dredging: These important studies of small-scale suction dredge operations show impacts on the environment have a less-than-significant footprint. Furthermore, they make note of beneficial factors that create an overall net benefit to some areas. These factors need to be taken into consideration when interpreting suction dredge activities and further incorporated into best management practices agreements. Results of the Gregory 1993 report notes that any reduction in feeding efficiency of fish may be offset by reduced risk of predation at moderate levels of suspended sediment. CH2M HILL in 2000, added to that result showing that elevated total suspended solids (TSS) conditions, similar to turbidity plumes created from dredging activity, have been reported to enhance cover conditions, reduce piscivorous fish/bird predation rates, and improve survival. Stern 1988, stated that, “Pools created by abandoned dredger sites can provide holding and resting areas for juvenile and adult salmonids”. Harvey 1991, studied fish size and habitat depth relationships in headwater streams. During times of low flow in a river or stream, increased water depth can provide a refuge from predation by birds and mammals. 2001, Siskiyou National Forest, found if excavated pools reduce pool temperatures, they could provide important coldwater habitats for salmonids living in streams with elevated temperatures. In1999, the U.S. Environmental Protection Agency reported the results of a cumulative field study evaluating the performance of 10, 8, and 4-inch gold dredges. The findings showed an increase in macroinvertibrate density and improved diversity in mined areas. In 2010, The American River Spawning Gravel Supplemental Environmental Assessment (EA) points to the benefits of additions of spawning gravels even coming from an outside source. The addition of spawning gravels are to increase and improve Chinook salmon and steelhead spawning and rearing habitat. Tailings from small-scale suction dredge mining provide excellent spawning gravel. Suction dredging breaks up compacted steam beds; the gravels are dispersed by the high stream flows, making up suitable spawning gravels each year. If insufficient substrate is available Salmonids are left with the choice of spawning over and destroying previously built redds, or using cleaned dredge tailings. Additional benefits of small-scale suction dredge mining include:Measureable improvement in water quality due to removal of wastes left by other users of the waters or that have eroded into the waterways. 100’s of pounds of lead fishing weights, bullets, water bottles, sunglasses, car debris, nails, broken glass, etc. are removed from our waterways and camping and recreational sites by miners every year. Laws should be based on facts not on opinion and conjecture. Cooley, M.F. 1995. Forest Service yardage Estimate. U.S. Department of Agriculture, U.S. Forest Service, Siskiyou National Forest, Grants Pass, Oregon. Griffith, J.S. and D.A. Andrews. 1981. Effects of a small suction dredge on fishes and aquatic invertebrates in Idaho streams. North American Journal of Fisheries Management 1:21- 28. Harvey, B.C., K. McCleneghan, J.D. Linn, and C.L. Langley, 1982. Some physical and biological effects of suction dredge mining. Lab Report No. 82-3. California Department of Fish and Game. Sacramento, CA. Harvey, B.C. 1986. Effects of suction gold dredging on fish and invertebrates in two California streams. North American Journal of Fisheries Management 6:401-409. Hassler, T.J., W.L. Somer and G.R. Stern. 1986. Impacts of suction dredge mining on anadromous fish, invertebrates and habitat in Canyon Creek, California. California Cooperative Research Unit, U.S. Fish and Wildlife Service, Humbolt State University. Cooperative Agreement No 14-16-0009-1547. Huber and Blanchet, 1992. Water quality cumulative effects of placer mining on the Chugach National Forest, Kenai Peninsula, 1988-1990. Chugach National Forest, U.S. Forest Service, Alaska Region, U.S. Department of Agriculture. Lewis, 1962. Results of Gold Suction Dredge Investigation. Memorandum of September 17, 1962. California Department of Fish and Game, Sacramento, CA. North, P.A., 1993. A review of the regulations and literature regarding the environmental impacts of suction gold dredging. U.S. Environmental Protection Agency, Region 10, Alaska Operations Office. EP 1.2: G 55/993. Prussian, A.M., T.V. Royer and G.W. Minshall, 1999. Impact of suction dredging on water quality, benthic habitat, and biota in the Fortymile River, Resurrection Creek, and Chatanika River, Alaska, FINAL REPORT. US Environmental Protection Agency, Region 10, Seattle, Washington. SNF, 2001. Siskiyou National Forest, Draft Environmental Impact Statement: Suction Dredging Activities. U.S. Department of Agriculture, U.S. Forest Service, Siskiyou National Forest, Medford, OR. Stern, 1988. Effects of suction dredge mining on anadromous salmonid habitat in Canyon Creek, Trinity County, California. M.S. Thesis, Humbolt State University, Arcata, CA. Thomas, V.G. 1985. Experimentally determined impacts of a small, suction gold dredge on a Montana stream. North American Journal of Fisheries Management 5:480-488. US EPA, 2001. Mercury Recovery from Recreational Gold Miners. Wanty, R.B., B. Wang, and J. Vohden. 1997. Studies of suction dredge gold-placer mining operations along the Fortymile River, eastern Alaska. U.S. Geological Survey Fact Sheet FS-154-97.